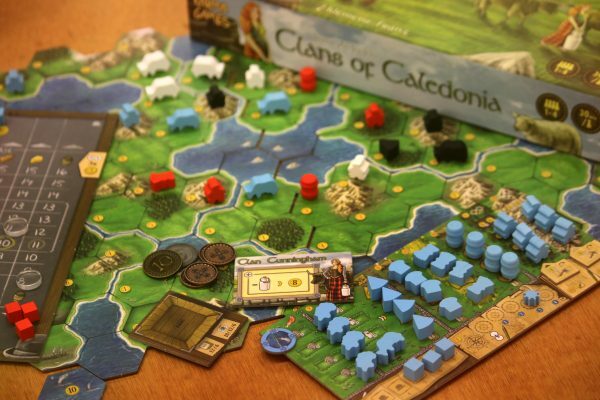 Clans of Caledonia is a strategy game for 1-4 players about whisky, trade and glory! The game was crowdfunded on Kickstarter at more than $400,000 in 2017. It is already among the top 35 strategy board games of all time on Boardgamegeek ! The board game Clans of Caledonia contains cardboard coins. 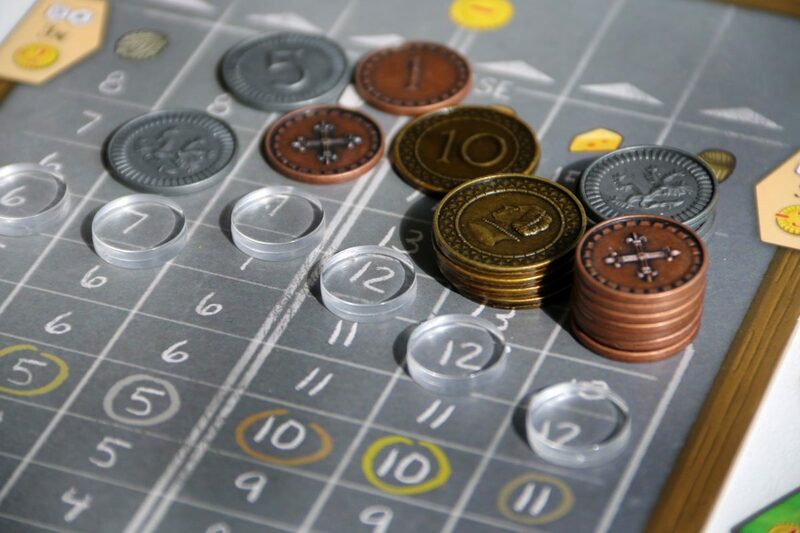 You can now purchase 70 custom, thematic metal coins to enhance your game experience, both visually, haptically and acoustically. The metal coins have a rim and can thus be perfectly stacked. 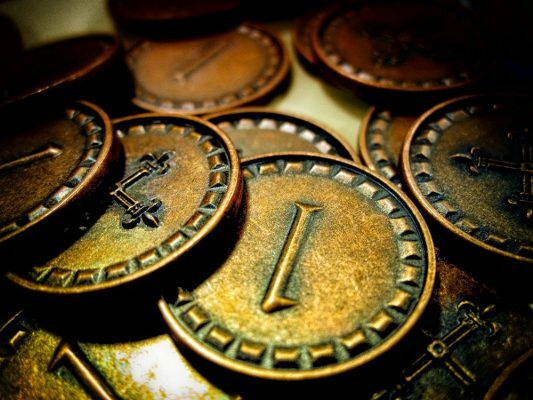 In contrast to cardboard money these metal coins do not suffer from any wear & tear. Perfect for an economic game with such a high replayability! 1. 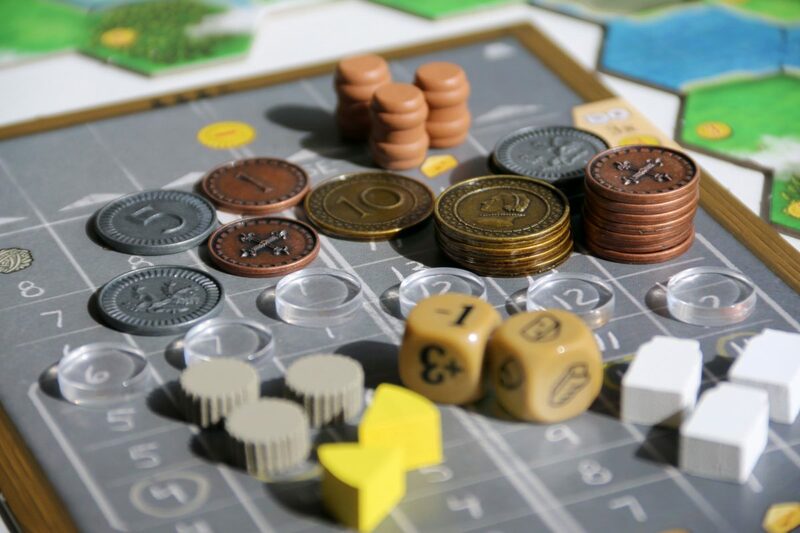 Players take turns and do one of 8 possible actions, from building, to upgrading, trading and exporting. When players run out of money, they pass and collect a passing bonus. 3. Players receive glory depending on the scoring tile of the current round. Players need to adjust their glory markers only 5 times in the whole game. 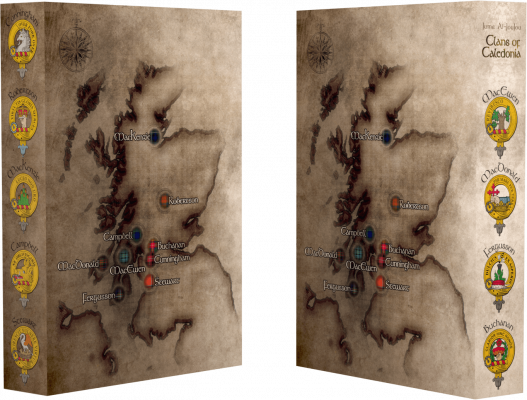 The game features nine clans: MacEwen, Stewart, Robertson, MacDonald, MacKenzie, Campbell, Cunningham, Fergusson and Buchanan. The modular board, the nine different clans with unique powers and the multiple scoring and port tiles ensure outstanding replayability. In the 19th century, Scotland made the transition from an agricultural to an industrialized country that heavily relied on trade and export. 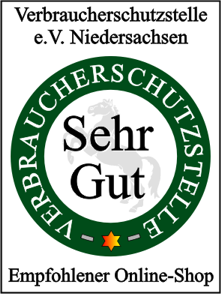 In the following, the food production increased significantly to feed the population growth. Linen was increasingly substituted by the cheaper cotton and raising sheep was given high importance. More and more distilleries were founded and whisky became the premium alcoholic beverage in Europe. 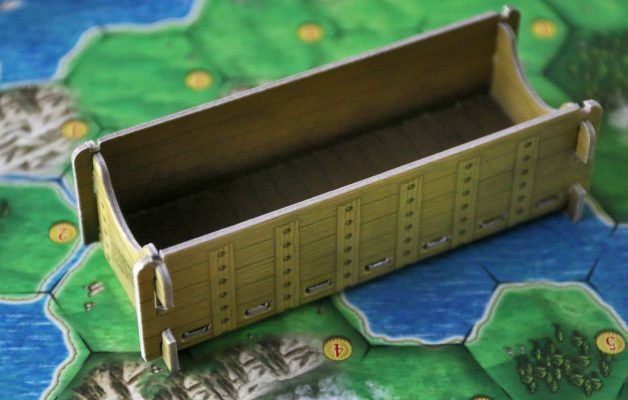 Players represent nine historic clans with unique abilities and compete to produce, trade and export agricultural goods and of course whisky! 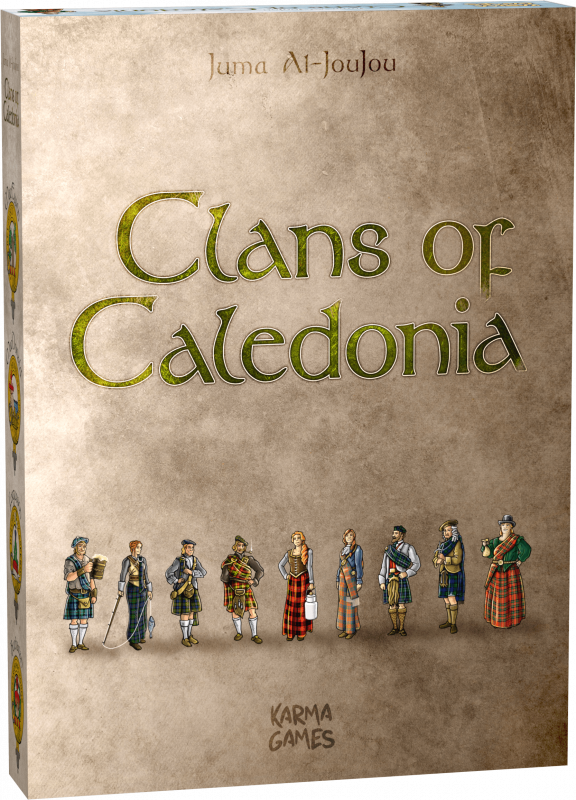 The following video reviews give you an impression what popular game reviewers and experts think of Clans of Caledonia. Tom is the most influential board game reviewer world-wide with more than 188,000 youtube subscribers! 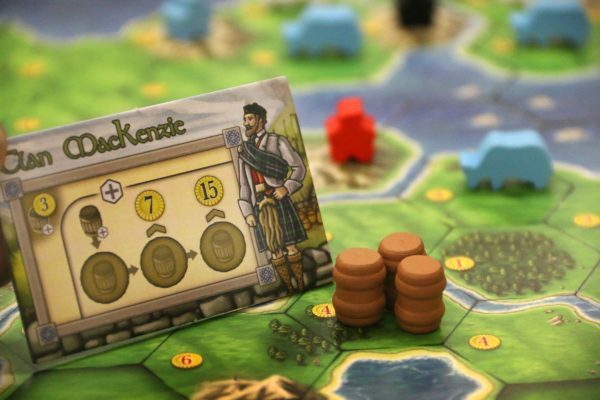 He loved Clans of Caledonia and gave it the Seal of Excellence ! Rahdo loves euro games and his 75,000 youtube subcribers prove how polular he is as a board game reviewer. 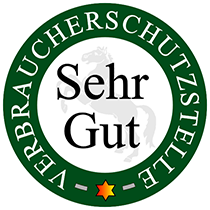 Final Score: 5 Stars – Amazing. Easily in the running for best of 2017. This belongs on the shelf of every player who calls themselves a Euro-gamer. 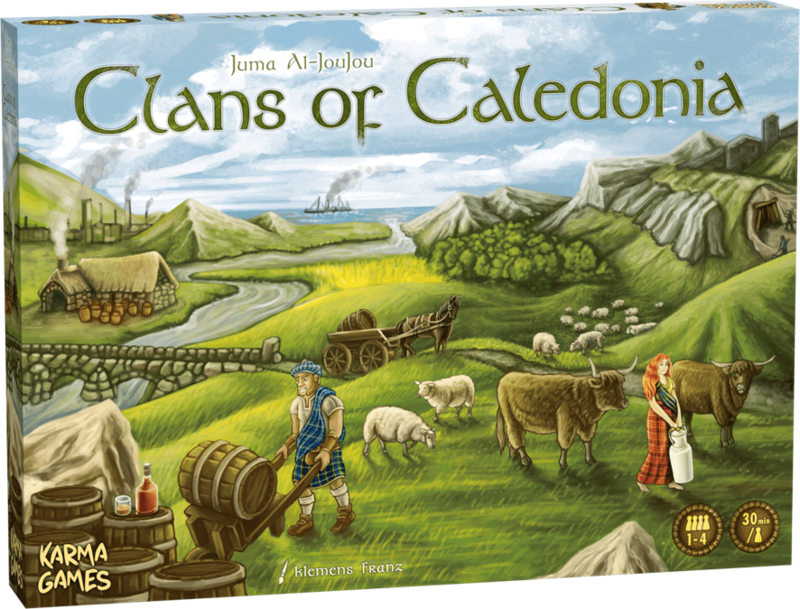 Clans of Caledonia is easily one of the best Euro’s released in 2017. Not only does it play extremely well at all player counts, it does so in a time effective manner. 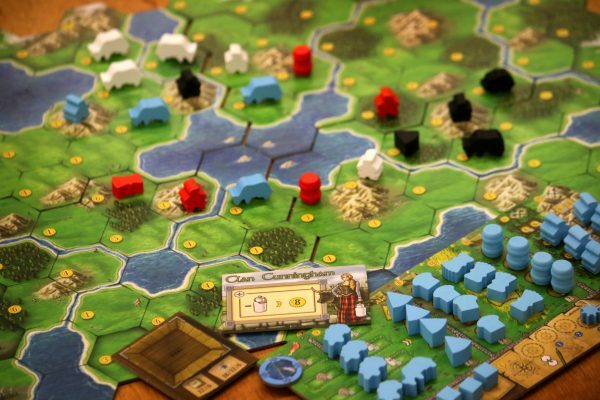 Visually, Clans of Caledonia is one of the most well put together games that I have ever played. 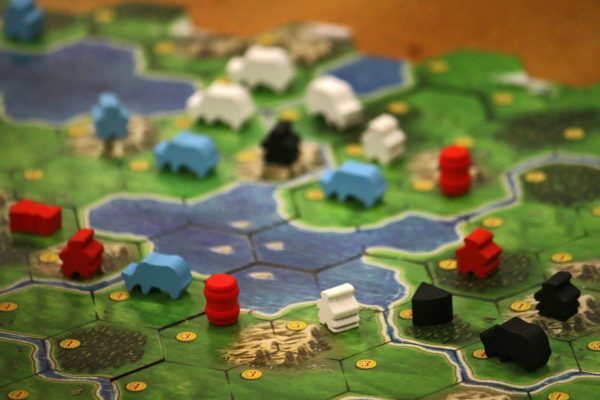 Mechanically, Clans of Caledonia is just a stellar game. All three of your inital workers do not need to be adjacent to each other but must be placed on border spaces of the active map. If you expand into a space neighbouring several opponent spaces with units deployed, you may use the Neighbourhood bonus for each of these units. You cannot buy more than three pieces of the same type of Good per turn, (four pieces in a 2 player game) even when expanding into a space neighbouring two identical units. Rare goods scoring (Cotton, Tobacco, Sugar cane): If there is a tie regarding the amount of Imported Goods, Cotton is the rarest, followed by Tobacco, then Sugar cane. Example: 5 units of Cotton and Tobacco were imported each and 7 units of Sugar cane. In a tie, Cotton is rarer than Tobacco so Cotton is the rarest, tobacco is the second rarest and Sugar cane is the most common import good. Thus, each Cotton is worth 5 VP, each Tobacco is worth 4 VP and each Sugar cane is worth 3 VP.